I've never seen/heard a mz 2000, but ...from others' decriptions, the mz2000 was the better keyboard. It is more versitile...being able to use more than 1 DSP effect at a time, and generally more parameter controls. 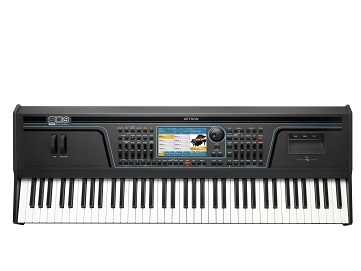 The wk3000/3500s are also good keyboards, with great tones, ability to download new tones/rhythms/effects. Also they have a 76 note keyboard. The down side on the 2000 is that it is out of production...so you would have to find a used one. DSP is 'Digital Signal Processing', like adding reverb, echo, phaser, ect... Another words, adding sound effects to a tone. The MZ-2000 was a very good keyboard but it still was quite expensive for the Casio brand of products I don't quite think it ever really found a market. Those used to buying Casio keyboards for a few hundred bucks weren't prepared to pay the higher price tag and those buying supposed "Pro" keyboards weren't so open to buying a high end Casio. But it really was and still is a very good keyboard that competes well with other brands. Casio has always provided great value and the MZ-2000 was no exception. You're right about that price on that beast Nigel It was selling for over $1,000 When I first saw the board I didn't know what to think. I saw all the features (which were way beyond any Casio), and then I saw that price. I wish Casio would come out with a newer version of it. You're right too in that the Casio buyers weren't ready for this model. The typical Casio's as you stated were a few hundred at most, and here Casio releases one for over a grand. Let me know those of you who ARE definately interested in NEW CASIO MZ-2000s. For security purposes (and easy of mind on transactions), I'll have them on EBAY soon- unless there are some who won't mind meeting here in MD. Ofcourse other methods of transactions can be discussed. The fact is that the MZ2000 was really a Technics keyboard to which Casio added the drawbar option and the microphone input, all the rest was identical to the Tehnics model (that still was twice as expensive). Probably Technics was even making the boards for Casio and put their name on it. But now Technics completely witdrew from the instrument market, so perhaps Casio can't get them anymore.